Princeton is an outstanding herdsire with many award winning offspring, including multi-champion Maria de La Mancha. He's been "top dog" at La Mancha for several years. However, he is now related to 25% of our herd and we must make room for new blood and let some of our other boys move into the spotlight. This will include his award winning 1/2 brother, Bizcocho's Encore, and a 2013 "cookie cutter" edition of himself, Antonia's Prince. We will truly hate to part with Princeton. He is family! But all good things must come to an end. Co-owners, Falkor Ranch Alpacas and Horse Mountain Alpacas are in agreement. It is time to let others enjoy what Princeton produces. We have greatly reduced his purchase price and would even consider a trade for a male of comparable value, unrelated to our three herds. We would like to retain a few breedings. Call any of us for additional information on Princeton or his offspring. First born son of CND Accoyo Bizcocho, Princeton is a Modern Dark Rose Grey with no spots. In his very first show, GWAS 2007, he took 2nd in his class. Judge Amanda Vandenbosch made the comment that he had the best conformation and by far the best fleece in his class, but placed him 2nd because of his size. He had just turned 6 months of age. He went on to take 1st and Reserve Champion at the National Sweepstakes in 2008. At over 6 years of age, he maintains an incredible handle and his latest AFD is 23.6 microns. His histograms for the last 3 years show less than a .5 variation in micron size. 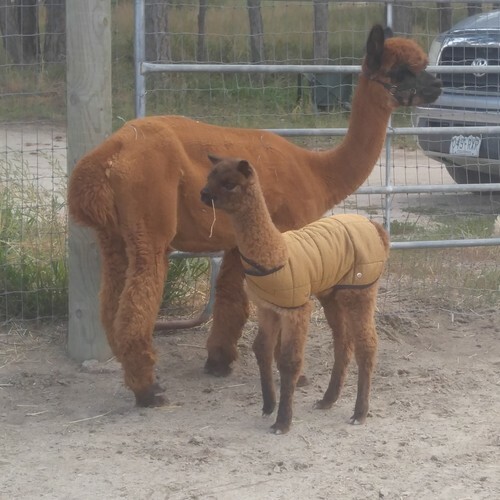 Princeton's first crias arrived in 2010. They are fantastic! 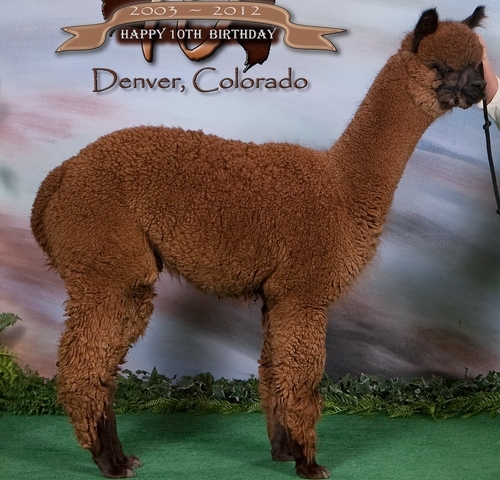 Many are award winning replicas of their daddy's good looks and great fleece! 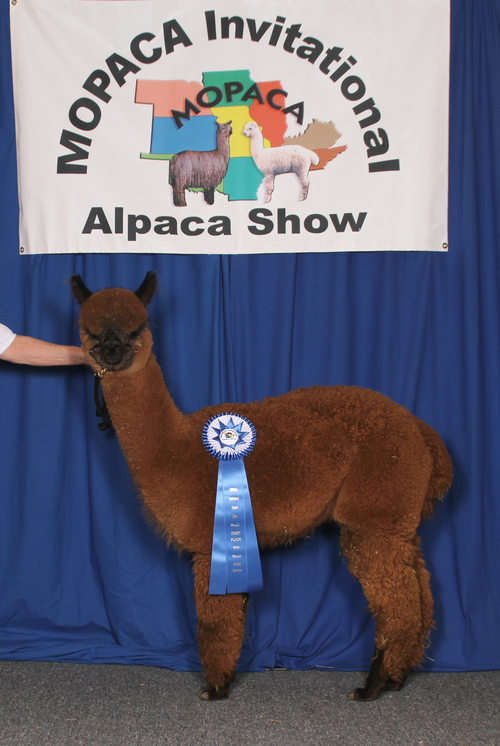 To date his offspring here at La Mancha alone, have racked up 9 blue ribbons and 4 Color Championships in the show ring. 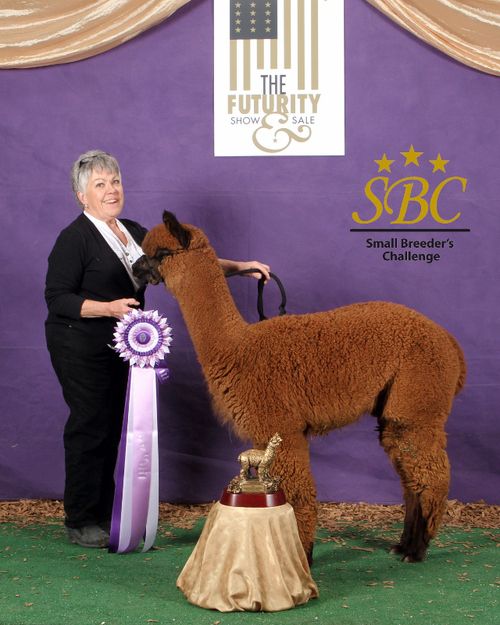 If you are looking for density, fineness, color & Accoyo genetics, Princeton is the one to breed to your girls. 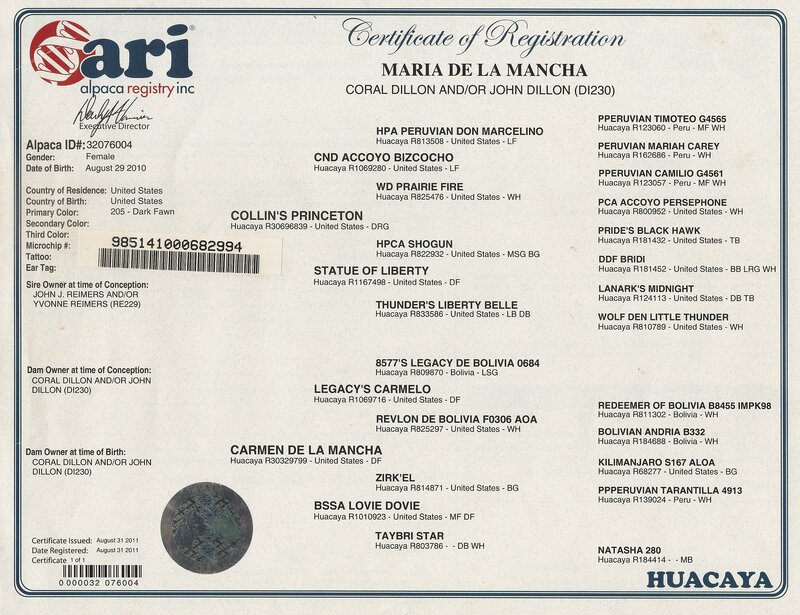 Maria is the total package when it comes to conformation and balance. She'll steal your heart with her calm, sweet disposition. She's a real 'pro' in the ring, having taken a blue ribbon in her 1st eight shows. She went on to claim the color championship four times. In the 2-year old class at GWAS 2013, her grey genetics were begining to show through, so she placed 3rd behind two larger girls from Crescent Moon. If there is anything negative to say about Maria, it would be her smaller size and shorter staple length. However, one hand spinner said she had a lovely, fine, spinable fiber and carding was almost unnecessary. Although her show career in the ring is over, we will continue to look for awards in the spin-offs and see the awards of her offspring for years to come. Maria is now an experienced mama. Her first born was a Bay Black female by MR Sizzlin' Rose. Her second was a Light Fawn female by Autumn Sun's Apache Longbow. Zaneeta was a gorgeous little girl, but, unfortunately, we lost her at 2 months of age. That breeding, however, was repeated and we are now watching the growth and development of Maria's newest addition to the herd, Lady Larkin. Financing is available to qualified buyers for sales over $1000. With a minimum of 30% down, we will work together on a payment plan over a period of 12-36 months. Time of possession is determined on a case by case basis and transportation is at the expense of the buyer. We can deliver within 150 miles for a small fee.